Do you ever read the quotations endorsing a book? As a PR person, I am often in the business of suggesting quotes for busy corporate-type people, so I am interested in quotes and perhaps the hidden meaning within. Sometimes the hidden message is thanks for also endorsing my book or OK, now you really owe me but sometimes the message is straight up this is a fascinating read and I'm so enamored by this book, I will shout it from the rooftops. And then, sometimes you are the mayor of a small town and your PR person is either on vacation or is one of those people who pretends to be a PR person but is actually your sister-in-law who likes to plan parties and types everything in Comic Sans and you are asked to endorse a book called Side-Yard Superhero by some smiley professor guy who is a bigshot in the Ozarks, wherever that is. 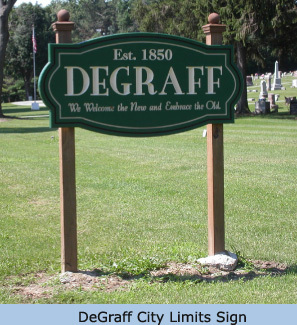 SO, you flip through the book you are asked to endorse that happens to be about your little town and you come up with Welcome to DeGraff, Ohio. I promise you will love our town. Really? Welcome to DeGraff comma Ohio. Is that the best you got? I know this guy is only President of the University of the Ozarks in Arkansas (it's not like he's E. Gordon Gee, for heaven's sakes) but he's probably one of the most successful people to ever write a book solely about DeGraff. Perhaps the only person to write a book about DeGraff comma Ohio. And in writing Side-Yard Superhero, Dr. Niece even invented a new literary term: Automythography: A work of nonfiction that looks reflectively at what we think we remember it; an iridescent memory based upon the author's truth and personal narrative. And it's a good book. A touching book about life in simpler times. And simpler times are HOT right now, Mayor. We rural folk don't understand this fully but these people called hipsters and those soccer Moms on Facebook are ALL ABOUT simpler times right now. It doesn't get simpler than DeGraff. Sorry, that may have come out wrong. My point, Mayor, is that the story of paper boy Rickie Niece and his innocently genuine relationship with wheel-chair-bound Bernie is touching and funny and a wonderful slice-of-life featuring real people from DeGraff. Real people. Mayor, I'm not sure you see the potential benefit for DeGraff should this book grow wildly popular. And I would think you would be doing everything in your part-time power to help. That's why I just can't believe you didn't have anything more to say about Side-Yard Superhero than I promise you will love this town. Small-town life is full of characters and thanks to DeGraff son Rick Niece, ours are remembered in this touching story. DeGraff son Rick Niece takes his readers back to a simpler time. Fortunately, not too much has changed here and we invite you to pay us a visit. So many of us in DeGraff recall the time and place and characters in Rick Niece's book. Now everyone can share our memories. Mayor, maybe you have done more to endorse this book than it appears. And if so, I applaud you and hope you take my gentle critique in the spirit in which it was intended. And even if you don't remember Rick Niece or you wish he wouldn't have told the story about the lady who ran around in her bra, then at least think of the memory of Bernie and how society might officially be kinder to people like him now, but there are still too few people--young and old--who are stopping their daily routine to really care. No actual Mayors were harmed in the creation of this blog post. I received a free copy of the book to read and enjoy but you probably already figured out that this review is entirely my own. Learn more about Side-Yard Superhero at www.RickNieceBooks.com.